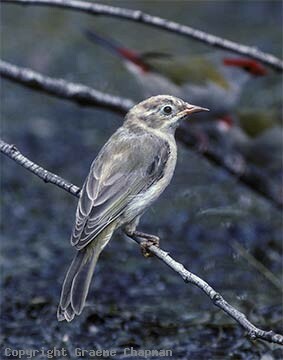 Although most members of the genus Melithreptus are communal, Brown-headed Honeyeaters appear to form larger groups - families of up to a dozen or so are not uncommon, but up to twenty have been recorded together, more than likely two or more groups attracted by food or water. 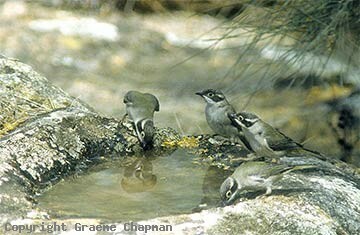 They occur right across southern Australia in dry eucalypt woodlands, mallee in particular. In any family, there is always the principal pair of adults, both easily identified by their orange feet! 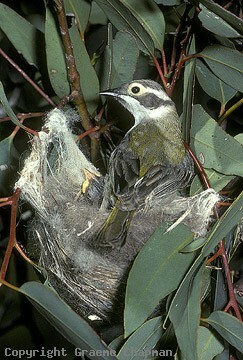 The old female does most of the nest building and incubation, but all (or most of) the other members help to feed the young. 583203 ... Brown-headed Honeyeater, juvenile with turquoise eye-ring. 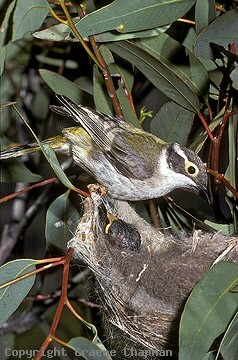 583204 ... Brown-headed Honeyeaters live in family groups.